Robert Rooney was born and educated in Melbourne, and he attended Swinburne College of Technology 1954-57. Rooney’s career has encompassed painting, collage, prints, music, photography, and commercial art and design. He has exhibited throughout Australia and been included in a number of significant exhibitions including the Biennales of Sydney 1986, 1990 and ‘Cubism and Australian art’, Heide Museum of Modern Art 2009. Rooney’s 75 portraits of his colleagues and fellow artists were produced between 1978 and 1984. They followed on from his conceptual photo works of the 1970s. Whereas those earlier Instamatic works were presented in grid patterns of order and repetition and showed little concern for technical standards, Rooney wanted his portraits to be as perfect as he could manage. He formulated certain rules, such as using only available light and not cropping the images. Rooney often made portraits on the spur of the moment, however posing was also done in collaboration with the subject. Each portrait had elements pertaining to the subject’s character and work, though these often occurred through chance rather than design. The four portraits in the Art Gallery of New South Wales collection reflect a particular period in Australian art, when the now established artists were beginning their careers. They depict members of the contemporary art scene of the late 1970s to mid 1980s associated with ‘Art + Text’, an Australian art magazine published from 1981-2000. Jenny Watson is a Melbourne born painter. In this photograph Watson is dressed entirely in black, with dark hair and heavy eyeliner. 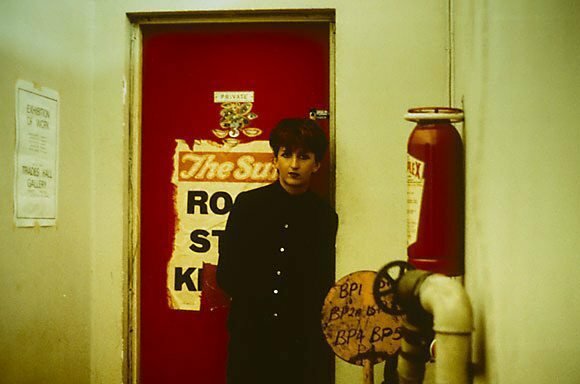 She is standing in front of a door plastered in stickers and an old cover of ‘The Sun’. This is reflective of her interest in contemporary pop culture. When this work was taken Watson had recently documented her association with musician Nick Cave and his group ‘The boys next door’ in a series of portraits. Watson has featured in many exhibitions throughout Australia and overseas. A number of her works are held in the Art Gallery of New South Wales collection.